This assignment presents a short feature radio program, named – What’s it like to be Romanian in London. The aim is to investigate why Romanians are in London. Also, one of my themes is to understand how/what Romanians think about London. In this radio feature I identified and investigated a part of the Romanian community in London. I approached the subject from different angles. I analyzed what London means for the people interviewed; moreover how easy is to be Romanian in London. The feature was made in 2004. The study will include the origins of the idea, the angle from which the story is treated, why this subject can attract the attention of audiences, how the story developed in time, recording sessions and techniques, the connection between the form and content of the subject and the news schemata format. Also, I will discuss the strengths and weaknesses involved in the creation of the artifact. In the past there have been many stories in radio, newspapers and magazines about immigrants. In Britain this has been a hot topic of discussion. In The Guardian on 10 May 2004 an article reported on the topic of the 100 years ago when Jewish foreigners come to Britain. According to the article “after 1880 tens thousands of Jews arrived in Britain from Eastern Europe and they were met with suspicion and fear”. “In 1900, some 3000 Jews left Romania crossed Europe by foot until they arrived on British soil”. The article mentions Robert Winder’s book – Bloody Foreigners, in which is examined “the first great immigration crisis of the 20th century”. The foreigners in the article are called “unfortunates who came here (Britain) to seek rest”. I want to investigate how this claim is regarded now to foreigners. As one of them, I decided to investigate what Romanians feel about London. During my studies I meet a number of Romanians living in London. Having knowledge why some Romanians leave Romania, I have decided to investigate how Romanians see London, how they feel in London and why they choose to come and live here. The subject of Romanians in London is interesting because of different reasons. Firstly, the radio feature has a target for all the audiences. The issue of a minority, who decides to live in a particular place, therefore to live and work is difficult. Moreover, due to the EU enlargement on May this year, the British press warned that millions would flood in. Probably in the near future, the number of new European citizens who come and live in UK will rise. The expected influx of workers and immigrants from the new member states is one of the most sensitive issues in the enlargement process. But despite all this, Romania is one of the countries, which is on the list to join the European Union by 2007. The focus of the theme is how and why Romanians like London. From a different angle, the audience will understand why people, especially Romanians chose London. The subject – Romanians in London is important news and people should know about this. My idea was to inform people and to make them more aware of this kind of news. In particular, English people because they are more interested in this sort of news. My intention was to inform audiences about people (Romanians) who want to live in London. Also, you need a proper place where the story can be ‘digested’. The radio feature might be well targeted to Radio 4 audiences. This particular news score is not a ‘need-to know’ feature, but tends to interest listeners. I think that my story would be relevant for broadcasting on Radio 4 because of the audience target. The station is targeted at people aged 30 onwards. The contents of the Radio 4 schedule are based on the formula: information and sport. It is very important to mention that the majority of the speakers are Romanians; the only two are from Italy and UK. The last two speakers have been interviewed in the lobby of the Brancusi’s exhibition at the Tate Modern. The speakers explain what they think about London. Why Romanians leave Romania and why they chose London? Do English people hate Romanians? Two of the speakers explain what they think on why Brancusi left Romania. What the two speakers up above mentioned know about Romania and what English people know Romania? Why are Romanians in London? According to Boyd (1997) “Your questions should be aimed at obtaining explanation, opinion and interpretation, rather than just mere facts”. (1997: p.36) I made sure all my questions were open-ended. In this case it encourages them to talk more. The narrative structure has a linear approach and develops as a story. It is very important the structural and conceptual importance of the editing process in the production of the radio program. The first speaker explains what she thinks of London. Seen as a “gift” and as a “universe”, these words tend to grab the attention of the listeners. For many of audience to be in London are not something extraordinary, therefore they will pay attention to listen why the first speaker believes so. Thus, the listener begins to get concentrated and to listen carefully what will follow. They might ask themselves “who is this person and why she is so excited about London?” Probably, the audience will understand straight away, that the speaker is one of the people from the countries that joined this year the European Union. The format includes an introduction explaining the topic and why I am reporting such a story. I introduce the new countries that join the EU and the aim of the feature, the audience will understand that the first speaker was in fact Romanian. The Romanian speakers agree with London as “a great place to be” or are described as full of opportunities. They came to London for “freedom”, “experience and money”. In one speaker’s view Romanians come to London because “they want more”. Clearly, from all the answers, people come to London (UK) to fulfill financially. The fourth speaker believes that London is his only home for now on. 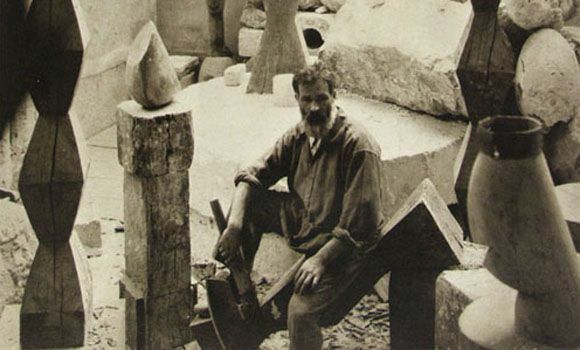 The idea of introducing Brancusi in the content of the feature was to examine if his migration to Paris represents the same thing that probably some Romanians decided to live in London. The two speakers (Italian and English) agree that Paris was the “New York of its time” and Brancusi was “pulled”. Artists described by the speakers as “nomads by nature” are looking for opportunities. Brancusi “spread his wings” to Paris. In the same way Romanians are coming to London to “seek opportunities and for a better life”. The knowledge about Romania is very little according to the speakers. To know more about Romania seems a good idea – “I would like to know more”. The feature finishes with the speaker’s belief that “London is my home, until I totally close my eyes”. This radio feature illuminated the speaker’s points of view on the topic of how is to be a Romanian in London. I think that the audience might be pleased with the information I offered. The feature is easy to listen. The short radio feature that I produced is similar to various other types of radio programs that have already been broadcasted on radio stations. In fact, Radio 4 has many regular radio shows from ethnical stories to sport and cultural news. Its approach to immigration subjects has same basis as other possible radio programs targeted to Radio 4. All the recording sessions took place at the expert’s places, excluding the speakers interviewed at the Tate Modern. I planned from the beginning the questions that I supposed to ask. The recorded and editing techniques took place in the South Bank University labs. The format is based on questions and answers; the topic is treated as news. The music by Moby is easy to listen, therefore suitable for the topic. The feature delivers ‘verisimilitude’ and authenticity to the listener. Probably, the content of the radio program might encourage bias and disposition to a particular ideology or perspective. The idea of reporting such news, I think that is a challenging but not original. The immigration issues are very much broadcast on radio, especially now when the new countries joined the EU. According to Linda Gage (1999) “the listener may not be able to absorb an idea right away” (1999: p.19) If the first speaker present her feelings about London, ‘encoding the news’, the reporter and the rest of the speakers are ‘decoding’ her feelings. I finished the interview with a high note. People tend to remember best what they hear first and last, so I have tried to make it both ends sparkle. As the fourth speaker agrees, London is his home for the rest of his life. The editing sessions took place in the university’s lab and I used the non-linear editing software machines. I also used the portable digital recording equipment (the recording minidisk) and the microphone. The total time of the feature is 7 minutes and 48 seconds. The short radio feature produced and present it has an interesting theme. The listener must be in contact with all that happens around him. This is a good opportunity to learn about a minority living in London. Robert McLeish author of Radio Production states “The topic for a broadcast should be a matter in which there is a genuine public interest or concern.” I think the topic of my radio feature would definitely be of interest. One of the most recent news stories was the scandal of the visa scam in Bucharest and Sofia. My radio program I feel would appeal to almost everybody. Finally, I hope that this piece can help other students in creating an image of what news report can be. The list of details for the expert’s contract interviewed in the short feature radio: Ms A. Babes, Mr S. Pandelea, Mr R. Hanganu, Mrs U. Riciardelli, Mrs M. Crowley.